How to get rid of jaw pain? : The severity of jaw pain can only explain how serious the issue at hand truly is. 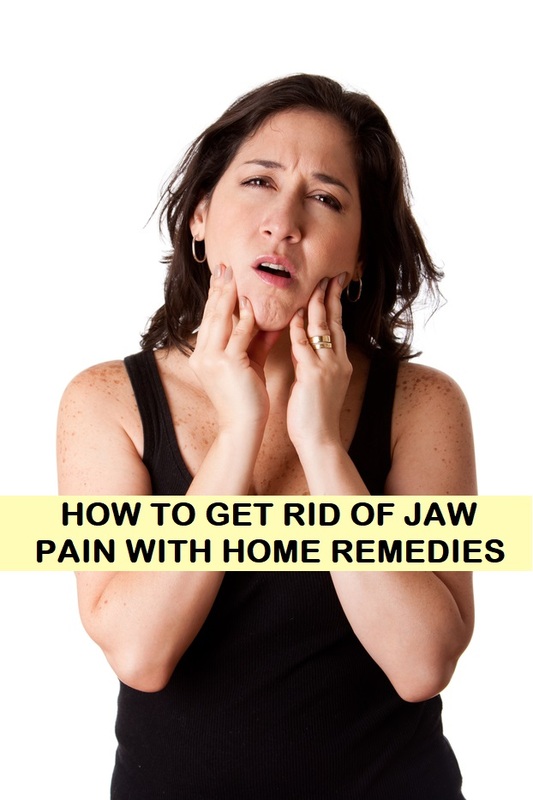 Narrowing down the exact cause is not a simple task, but when common jaw related issues are responsible for the pain, oftentimes the condition can be easily cured by a number of home remedies. Natural treatment after all is the safest although may take time to show results, considering there are no side effects and the materials used are all natural. Without further ado, let’s dive right into the list of home remedies to get rid of jaw pain. We have also taken the liberty of including a few “don’ts” while experiencing jaw pain, simple things that won’t matter much until you find out about its potential negative impacts. Much like treating other injuries, hot and cold compresses (both) work miracles to bring down jaw pain significantly. Heat packs can be used to effectively bring down the pain. This can be done by wrapping a hot water bottle with a warm, moist towel that helps improving function and in effect, reducing the pain factor. Be careful not to burn yourself during the process, however. Ice packs, on the other hand are equally effective in bringing down the inflammation significantly. Furthermore, it also numbs down the pain, whilst pushing the healing process altogether. Ensure not to place the ice pack directly onto your face though. You might want to wrap it within a clean piece of cloth while doing so. Also, dab it against your skin for not more than 10-15 minutes. The numbing sensation should kick in by then. This is surprisingly effective; be gentle while doing so, and follow the simple exercises. One of them is passively opening and closing your mouth, slowly and steadily. This is one of the most effective ways to get rid of jaw pain. If you wish to kick it up a notch, see your doctor about this, and ask for more advanced exercises that won’t negatively affect your gums. These exercises will not only help bring down the pain, but also strengthen the jaw muscles by a great factor. Ensure that you don’t overdo it; they must be performed in moderation. Gargling has been effective in combating many oral- related issues and proves to do wonders in bringing down jaw pain. Add a pinch of saltwater if you wish to bring up the level of effectiveness. Swish the solution around, so as to ensure the salt mixes with the water, and ensure not to ingest the solution. This solution helps in treating infections that may be the potential cause for the jaw pain. This is a major factor for unexplained pangs of jaw pain. It serves as a great home remedy to get rid of jaw pain that generally accompanies headaches. You will benefit greatly by picking up some relaxation techniques along the way, such as meditation or yoga. Additionally, make a note to rest adequately and maintain the right posture. Who ever knew that a good old cup of OJ could say goodbye to jaw pain? If you wish to pick it up a beat, add 500 milligrams of powdered calcium to the orange juice before ingesting it. Some powdered magnesium (not more than 250 milligrams) should be effective. These minerals must be consumed so as to promote muscle relaxation, thereby reducing stress and tension in the jaw muscles. If you don’t want to mix it in your orange juice, you may orally consume the capsules as well. Note, however, that the powdered form is more easily absorbed by the body. Did you know that the right diet might be the first step towards relieving jaw pain (if not cutting it at the source)? The first tip would be to avoid hard or chewy foods that might require a lot of chewing. For instance, chewing on crunchy foods such as raw vegetables or thick bread can aggravate muscle pain around the jaw. For a few days, restrict your diet to plenty of liquids, apart from items such as mashed potatoes, soup, bananas, milk, cottage cheese and vegetable juices. For those of you who want to keep a track of your diet and indulge in a juice fast, this is the perfect time. In order to get rid of jaw pain, you have to stay away from caffeinated products that are susceptible to spike up muscle tension. To make your chewing process easier, cut your food into smaller sections. Brush your teeth after every meal (if not, at least twice a day) and always use fluoride toothpaste. Some people find that brushing can be a painful activity while undergoing jaw pain, but do so slowly, and retain from opening the mouth too wide to reach the second molars. Related: How to get rid of headache in natural ways? Try to include about half an hour worth of aerobic exercises a few times a week. It has been proven that a break from stressful activity, and indulging in exercises reduces the stress level by a great factor, as the production of the endorphins acts as a natural painkiller. If you sit in front of a computer, or on a work desk for the majority of the day, ensure that you take some time to meditate. This helps in relaxing the muscles in your face and neck, which may be contributors to the jaw pain. If you’re under a stressful situation, refrain from grinding your teeth or clenching your jaw. If you’re used to doing this, try to hold your tongue between your teeth, so that you don’t grind them. If you’re used to carrying a huge purse with a lot of essentials, narrow it down to the bare minimum. Meaning, carry as lightly as you can. The weight affects your spine, which in turn effects the neck’s alignment. This is another contributor to jaw pain, and can be avoided by taking suitable measures. Note that if the pain doesn’t subside in a few days (up to 2 weeks), then it is best to consult your doctor. Sometimes jaw pain may require corrective dental therapy, or in worse conditions, surgery. Go ahead and try these home remedies to get rid of jaw pain naturally today!